This is a walk traversing Birmingham's city centre from west to east and back. It starts from Hagley Road Premier Inn, where there is parking, presumbably intended for guests of the hotel and the nearby restaurants. After following the main road inbound for a while, we turned into Monument Road (noting a domed building with an interesting history, the Birmingham Oratory ) and across Chamberlain Gardens towards the Middleway, the main ring road around central Birmingham (much of the former inner ring road, the Queensway, has been decommissioned in recent years to give the city centre a little more room to breathe and develop). After overcoming this obstacle, we cross a housing estate to reach the Birmingham Canal's old line at the Oozells Street Loop . This takes us into the city centre proper. 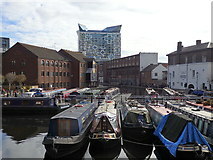 We meet the "new" line (at a mere 204 years, ) of the canal opposite Birmingham Arena and reach Old Turn Junction . From there follows a short detour up onto the plaza of the Brindleyplace development and back down to the canal, crossing over a footbridge to the rear entrance of the International Convention Centre . After dipping under Broad Street through its canal tunnel, we reach Gas Street Basin with its interesting history of competing canal companies resulting in the Worcester Bar , a narrow barrier left standing across Gas Street Basin to prevent water loss from the Birmingham Canal when the Birmingham & Worcester Canal was built. Leaving the canals for the railway, we turn towards Navigation Street and New Street Station (now hidden under the silvery plastic facade of the Grand Central shopping centre, ) and the recently extended tram line . The other end of the station faces another shopping centre, the Bullring , with some open pedestrianised streets. St Martin's Walk leads down to St Martin in the Bull Ring , Birmingham's first parish church. We cross the open markets south of the Bullring and cross the road named Digbeth (lending its name to this area of the city), turning east along Meriden/New Canal Street through an area of warehouses . After crossing under the railway viaducts feeding into both New Street and Moor Street Stations, we reach the Eastside City Park and the Millennium Point building , where we have a look at the Science Garden and spend some time in the Science Museum, Thinktank . Afterwards, as light is beginning to fade, we walk past the vast building site of the HS2 railway project towards Moor Street Station . From here, it is a matter of retracing our steps towards the canal and then back to the hotel along Broad Street and, after dipping under the Five Ways roundabout, Hagley Street. In daylight, I suppose following the Birmingham & Worcester canal until past Five Ways Station might have been a better alternative for the return from the city centre. You can see this trip plotted on a map on the Geo-trips page Link .